We have Plasmid Kits for microbial work with fluorescent proteins, synthetic biology, gene cloning and expression, as well as guide pages for Synthetic Biology and Bacterial Expression Systems. Check out our Genome Engineering Overview and our CRISPR guide to find out how to use genome editing techniques in your microbe of choice. For more help with CRISPR, read our recent blog post explaining how CRISPR is being used for bacterial genome engineering. 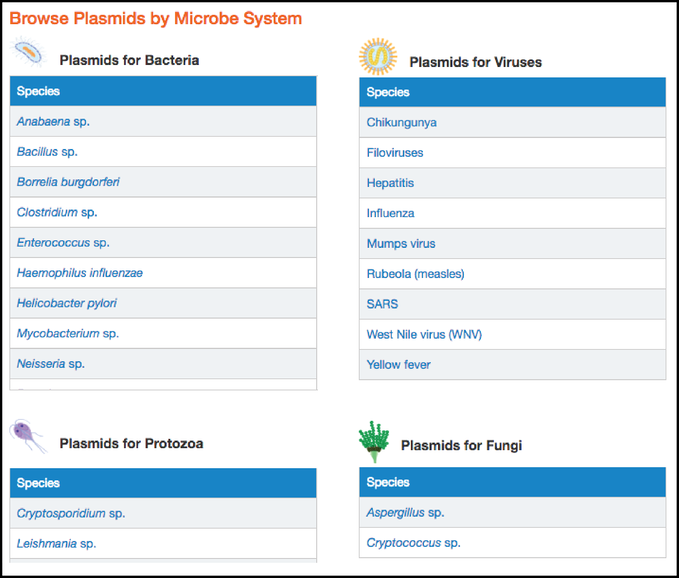 To make it easier for you to find plasmids for your work, plasmids in the Microbiology Collection are sorted by organism (see screenshot above). Don’t see your favorite organism listed? Help us serve you! Let us know about other organisms we should include by emailing us at help@addgene.org. If you are looking for plasmids used in E. coli and yeast, you’re in luck! Addgene has so many of these resources that we created filters just for them on our search page. Use the Expression and Insert Species filters on the right-hand side of the search page to narrow your keyword search to one of these organisms. Help Us Continue to Develop Resources for Your Community! To contribute plasmids made in your lab, see www.addgene.org/deposit or email deposit@addgene.org for more information or to start a deposit. If you have a colleague who would benefit from our free distribution services for their popular constructs, why not let us know? Fill out our referral form and we’ll take care of the rest. Know of a useful plasmid that’s not in the collection? Tell us about it with our Suggest a Plasmid Form! Finally, if you would like to get the word out about a particular microorganism, microbial technique, or microbial technology, sign up to write about it on the Addgene blog.